Martha's Marvellous Munchies: Food: Reduce! Reduce! This title reminds me of a story about the conductor of a choir. While they were rehearsing a piece, the sopranos persisted in singing too loudly. Finally he turned to them in despair and implored, "Please, ladies! Reduce!" For this first week of Lent I wasn't trying to reduce either my singing volume or my waistline. Just my meat consumption and kitchen plastic waste. The Parents' Guide to Climate Revolution is big on the idea that, while it's all fine saving our own little bits of the planet, what we really need is changes in the big picture - the governments and companies that control how we make energy and what we do with it. This means making some noise to push them in the right direction. So I started the week with a little bit of lobbying. I wrote to our local council to say that I was glad they use locally sourced meat and MSC fish for their school meals, and to encourage them to use their buying power to support better farming practices. I also wrote to the supermarket I usually go to, to ask if they could stock a wider range of Fair Trade products. They said they would look into it. 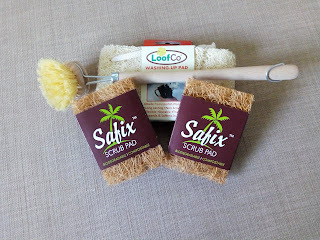 Ordered a wooden dish brush, a loofah sponge, and coconut fibre scourers from Boobalou. 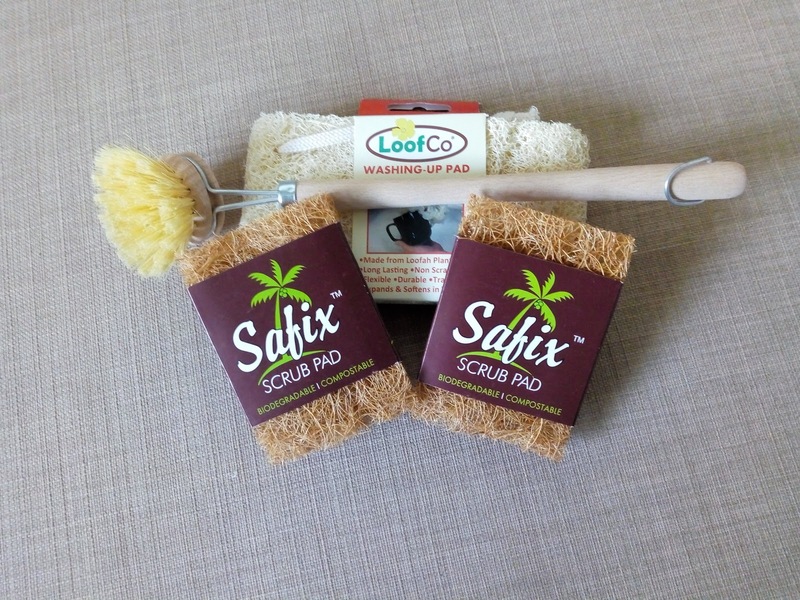 I usually use a cotton dish cloth, but we also have a dish sponge, a green scourer and a plastic dish brush living near our sink, so when they die they can be replaced by these non-plastic alternatives. I tried to keep the whole week fairly vegetarian (we sneaked in a bit of smoked mackerel one day), but I wanted to try a vegan day too. 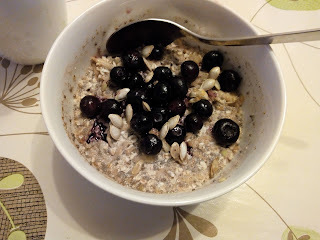 Graham and I started the day with apple and chia seed bircher muesli (recipe here). Effectively it's cold porridge; it was nice enough, but we agreed that the hot version is better at this time of year! For lunch I had some leftover dhal and rice, and for dinner we had Quorn bbq sliders, adapted from this Budget Bytes recipe. This is pretty easy, and I knew everyone liked it! I mixed some cabbage and carrot with bottled French dressing to make a vegan coleslaw, too. Dessert was canned peaches with vanilla soy yoghurt. Donated to some ladies from my church who are going a step further than being vegan! They're just eating beans and rice for five days, to raise money for Tearfund. Find their JustGiving page here, if you'd like to find out more. On my list was watching the documentary Meat the Truth, but it hasn't quite happened yet. Hopefully I'll fit that in next week. Remember that we started collecting all our plastic on day 4? Today was the day that we tipped it all out to see where it came from and what we could do about it. The boys and I divided it into categories and weighed it. Our total recyclable plastic was 560g, with most of that coming from plastic bottles (267g, plus another 94g of milk bottles). We get through quite a lot of squash - if anyone's got any tips on how to train your kids to drink water, let me know! I've completely failed on that. 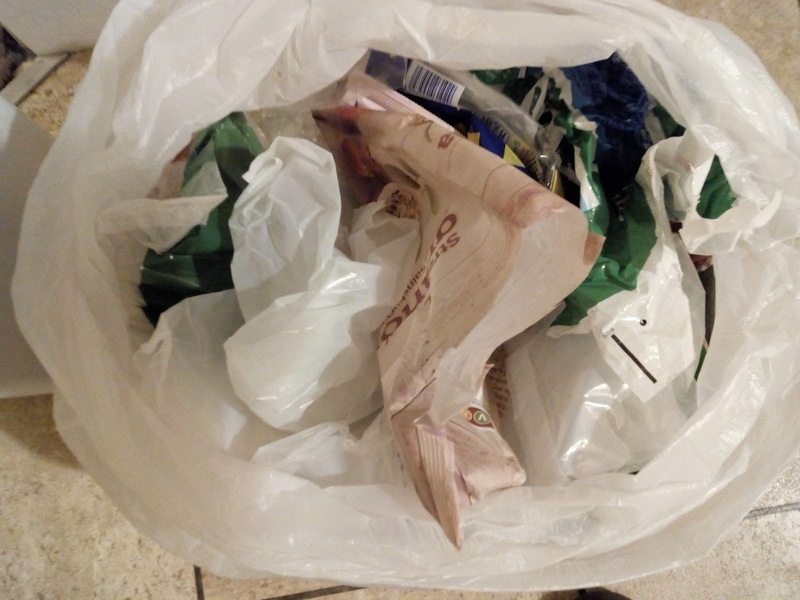 Our total non-recyclable plastic was 257g - mostly plastic wrappers of various sorts. Cereal bags, bread bags, vegetable and fruit wrappers. I've cut down on a lot of vegetable packaging by getting a vegetable box for the last few months, but this is full of the kind of stuff that the boys don't like - cabbage, cauliflower, sprouts - so I still buy a few extra bits, including frozen veg. It's difficult to see how to reduce this much, unless we stop eating cereal and bread! It was quite alarming how much plastic we got rid of in one week. Those plastic bags and bottles don't weigh very much, but we had over 800g of them! Still, the boys are doing "Waste Week" at school, and are supposed to be making something out of old plastic bottles. They dived into the pile with enthusiasm and much sellotape, and are gradually constructing a castle and a rocket. In summary, reducing our meat consumption is a lot easier than reducing our plastic waste! We've been cutting down on meat for a while so usually only have it once or twice a week anyway. Perhaps if I adopt the same tactic for plastic, it will have the same effect. Hi! This is where I write about family, faith, food and fun. You'll find poetry, recipes, photos and reflections, so please enjoy reading and leave me a comment to let me know you were here. Take a look at my other website, Cafes with Kids, where I review family-friendly cafes in and around Derby.